The Agnostic Fence: George Bush and the people trying to force the second coming. George Bush and the people trying to force the second coming. Recently I signed up for a book called The Messianic Bible. In my ignorance, I just assumed that this was a sect of Jews that believed in Jesus is the messiah and thought nothing of it. Interested to read more I signed up for a copy and was informed it wasn't yet ready for print but when it was I would receive one. Then I began to get weekly emails that were very much to do with the people of Isreal. I realised this was perhaps a lot more politically and religiously inclined than I had first thought. 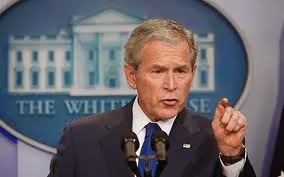 Then I see an article called George W. Bush to Raise Money for Group That Converts Jews to Bring About Second Coming of Christ you can read that here. Commentary Magazine warned that ' it must be understood that the visceral distaste that the overwhelming majority of Jews have for the Messianics is not to be taken lightly.' Source. So it's no wonder George Bushes scheduled attendance at the conference in Texas. The internet had a mixed response as the story spread across blogs and online news site a like, the consensus is not as black and white as you think given the above comment. There was a somewhat balanced debate, with some Jewish commentators saying they were not bothered by the MJBI but generally his planned attendance was met with disdain, including that off Anti-defamation league director Abraham Foxman. He stated he knew Bush was a lover of Israel and it's people and wouldn't embrace the ideology of the MJBI but wished he wouldn't attend all the same. 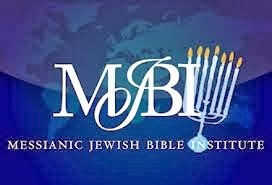 The bulk of the problem is that the MJBI and messianic Jews in general believe they are saving Jews by trying to get them to acknowledge Jesus as messiah and Savior, even if it goes against Jewish scripture it is the MJBI that is trying its best to theologically back up the claim, hence the production of the Messianic Bible. The problem arrises for most Jews is that by trying to get Jews to accept Christ they are no longer Jews, the major difference between Christians and Jews theologically is the belief in Jesus as Messiah and so by introducing this doctrine they are actually creating Christians and not as the MJBI believes, Jews that believe in Jesus for there can not be such thing. For Jews, there is no Father and Son; there is no Trinity: there is only Unity. One. That is a mindset with vast implications for how Jews see the world and behave in it. 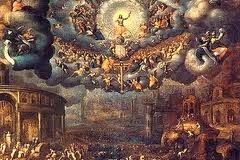 God is ineffable, certainly not a man, and God’s power lies precisely in that mystery. We accept that the biggest piece of the puzzle is left unsolved — that missing piece is the engine of our spiritual journey. It makes us, as individuals and as a People, inquisitive, skeptical of authority, relatively tolerant, empathetic — for if God is One, we’re all in this together — and eternally dissatisfied. That’s why when we start believing in Jesus as God, we stop being Jewish — not just in name, but deep down, in our souls. Why would it bring about the second coming? The MJBI make it clear there aims are to fulfil the requirement for the return of Jesus Christ. According to the New Testament there are a number of events that need to happen before the return of Jesus Christ including wars, false prophets, hatred for Christianity. However a lot of it centers around the Jews, their displacement and return to Israel and also their accepting of Jesus as lord. Many Bible verses seem to support the claim or are often used to do so. While I agree with the nature of the argument from Jews against the Messianic Jewish movement I do struggle to see how it differs to that of other religious proselytizing. Is it any different form Christian and Islamic missionary work, or preachers on street corners? We are always free to reject their ideas as they are always free to have them. So while I understand the issue I feel it runs deeper than theology and irks at the structure of Jewish customs and culture which is strong and has a long history, but it shouldn't seek to silence those that threaten it, it should merely ignore it.